Even though the weather hasn’t quite settled into spring yet, the Anacostia watershed has already been getting a lot of buzz this year. The watershed is doing better than it has in a long time, thanks to the hard work of many government agencies, organizations and advocates. And as the water resources and parks are improving, the river corridor is becoming an even more attractive place for recreation, leisure and adventure. Several groups—including those who have put a lot of investment into cleaning the Anacostia, like the DC Department of Energy and Environment and the Anacostia Riverkeeper— are working to change perceptions about the Anacostia by highlighting the assets and activities available to people who live nearby or visit. For instance, the Year of the Anacostia, a joint effort between dozens of organizations, is spreading awareness and excitement about the events and activities happening up and down the river all year long. 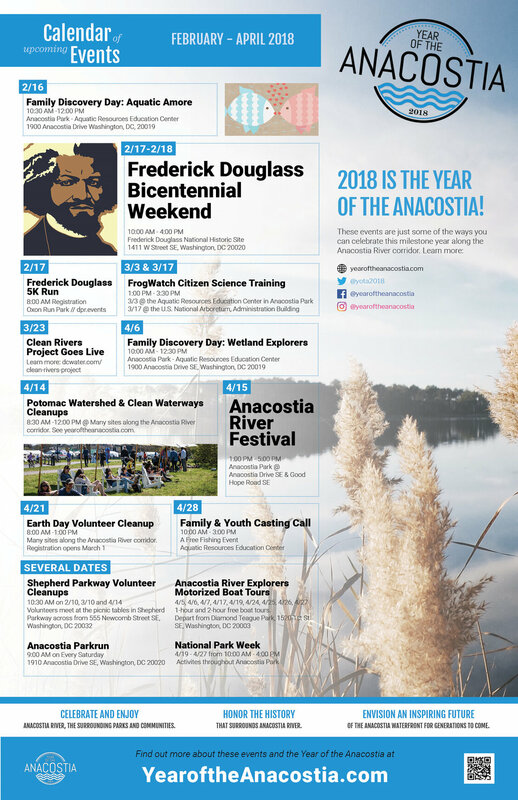 Centralized around a website and calendar of events, the Year of the Anacostia is cheering progress and improvements to the river with an ongoing celebration. At the same time, the Metropolitan Washington Council of Governments is coordinating several groups and agencies from DC and Maryland to create a new campaign that showcases the value of the river and its tributaries. These groups include the DC Department of Energy and Environment, Montgomery County Department of Environmental Protection, Prince George’s County Department of Environment, the Anacostia Riverkeeper, National Park Service and more members of the Anacostia Watershed Restoration Partnership. The current focus of that effort is to draw attention to the many, many opportunities to recreate on or adjacent to waters of the Anacostia watershed. One of the first fruits of that collaboration is a set of icons that any group is freely able to use to raise awareness about the Anacostia River, parks and tributaries, and the video below. If you are interested in using these icons and the video below, please contact Lisa Ragain at lragain@mwcog.org. This is a sample of the logos designed by the Prince George’s County Department of the Environment as part of an ongoing effort to raise awareness about the value of a healthy watershed. Bringing positive attention to the many ways residents and visitors can take advantage of our shared natural resources is something that DC’s Department of Energy and Environment has been doing for a long time. DOEE offers a variety of programs and activities focused on fun and environmental education, including the Anacostia Discovery Series, the Aquatic Resources Education Center, and the Anacostia Environmental Youth Summit. Graphic design media for some of DOEE’s programming - which is available to all DC residents and visitors! Some of the programs that DOEE hosts are funded by the 5 cent bag fee that was implemented as a way to address the pollution of trash and plastic bags that plagued the Anacostia River. When the agency first implemented a 5 cent fee for bags in grocery stores, it released a series of reusable bags (much better for our environment!) that feature some of the recreation activities that our investment in the river has unlocked. The agency is also producing a series of postcards with the same inspiring imagery. With all of this fantastic imagery, graphic design and positive messaging about recreation and use of the Anacostia River, its tributaries and the parks in its watershed, the next step will be making sure that outreach using these tools reaches a wide audience. It’s especially crucial to ensure that this message reaches residents living close to the Anacostia River, especially those who have suffered through the years when it was a noxious hazard.